A reclaimed, reproduction, cast iron fire basket with integral fireback. The basket has serpentine legs and pretty leaf designs to the front and side bars. 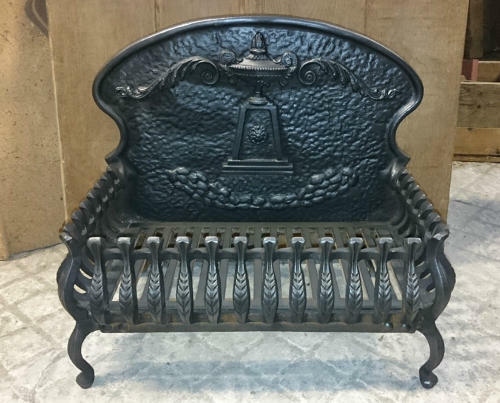 The fireback has an Adam style design with a large decorative urn, scrolling detail and a textured finish to the iron. The basket has a good amount of space for burning while not being to large or cumbersome. The firebasket has been blacked and polished leaving a rich colour and finish. The item is reclaimed and therfore has some signs of use and wear. The fireback has some cracking, visible mainly from the reverse. The fire is stable but due to cracking it is reccomended that the basket be only for light use. The back has surface rust as expected. There are some slight areas of surface rust to the front of the fireback, grill and basket. Some slight signs of use and wear. A very pretty firebasket that would add great style to a hearth. The basket is of a nice, petite, size and therefore would be perfect for a bedroom or smaller reception room. A quality item with great design.